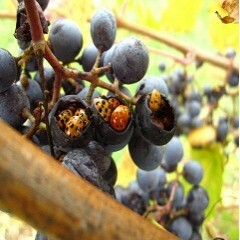 In conjunction with Greg Loeb, Professor, Department of Entomology, NYSAES, two replicated spray trials using 4 insecticides currently registered for use on grapes in New York State (Admire Pro, Danitol 2.4 EC, Leverage 360 and Sniper) were conducted by NYS IPM Program and LERGP staff in grower vineyards in the Lake Erie region. Historically, control practices for vineyard pests in the eastern United States were made based on the calendar or on a growth stage such as bud break, bloom or verasion using materials with a broad spectrum of activity. This was a fairly straightforward approach to pest management, and for many years this type of spray program was very effective. However, as the nation became more conscious of pesticide use, the Food Quality Protection Act (FQPA) was introduced, and broad spectrum pesticides were either restricted in their usage, grapes were removed from the label, or were banned completely. In the recent past, we have seen more choices in fungicides and insecticides come on the market, but the trend is now toward less toxic and narrower spectrum pesticides.